Your pork will arrive fresh from Grapetree farm. Waiting time may apply. Full carcasses include offal, head, trotters and pig blood if required. Please specify. The average weight per side is 28-38kg. 4 weeks notice preferred. 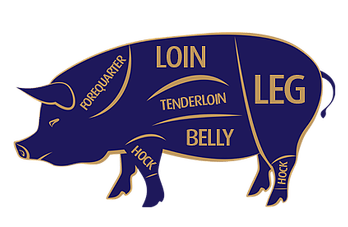 The price of your pork will vary depending on: a) what size pig you would like (or is available); and b) how you elect to have your pork broken down (chops, roasts, steaks etc). We will happily liaise with you to help you get the best value for your order. You can email directly, or we will respond to your order once it’s logged in the system. You are able to add our nitrate free, nitrite free, chemical free smoked goods to your selection at time of collection. Deposit payable to secure order. This product is sold by final weight, please let us know if you would like a larger or smaller side. We will email you to confirm the final order price and outstanding amount payable when your product is ready.